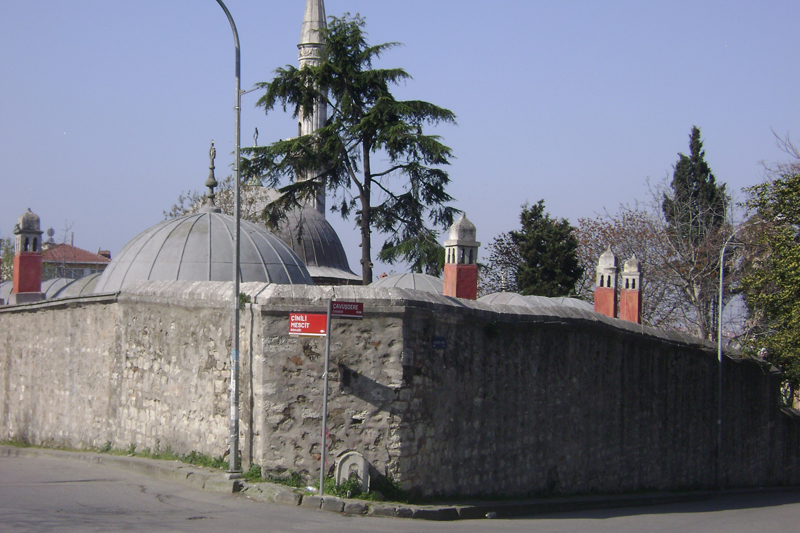 Çinili Bathhouse was ordered to be built in 1640 by Kösem Sultan. She had died by the time bathhouse’s women’s only part was finished and the construction was continued to be funded by her brother in her legacy. The bathhouse was originally planned to be used by the workers who are working in the construction of the Çinili mosque. The construction plan for the mosque had included a library and a police station as well as the bathhouse. But do not be mistaken by the word “Çinili” (this word, “Çini”, is used for a special type of blue porcelain used in the decoration of royal buildings and “Çinili” means “with blue porcelain”) because those fantastic works of art were stolen by thieves. Nevertheless the bathhouse’s managers had restored the authenticity of the bathhouse by decorating it with blue stones. The restoration process had only been done to the door ornaments and walls and thus the general architectural outline of the bathhouse had not been changed. Even the outer domes are preserved from the ruinous effects of time without seeing any restoration effort. Although it is hard to believe the reliefs on the marble basins also had not been touched or restored by any means and thus you can enjoy your bath in an uniquely authentic Ottoman bathhouse. The great August earthquake had not even scratched the walls of the bathhouse which are 2 meters thick. The historical aspects and beauty of the Çinili bathhouse had been heard and used by numerous directors and photographers and thus many movies and magazines had covered the bathhouse. Çinili bathhouse has a antique heating system. A huge boiler is placed between two domes, near to the bathhouse’s women’s only part. This boiler is heated by great logs and approximately one ton of log are used to heat the bathhouse in the winter season. The heat is directed through pipes which are routed under and through the walls the bathhouse. The excess smoke is thrown from chimneys called as “Tüfeklik” (which is also a special Turkish word which can be roughly translated as Riflehole). There are many aspects which sets Çinili bathhouse apart from the others. In addition to its authentic historical setting, the managers are very careful about general cleanliness and hygiene of the bathhouse as well as offering quality service, therefore you can enjoy your bath in the Çinili bathhouse surrounded by the fragrance of the 367 years of history. Generally the bathhouses are called dark and overcast, but Çinili bathhouse does not have these aspects. Because the bathhouse is spaciously built and the holes in the domes of the bathhouse does not block the sunlight. When the bathhouse is too hot, the bell shaped glass coverings can be removed to cool the interior.